Located in the fertile crescent of the Delta, Cleveland is a relatively young city that has been shaped by modern industry and Delta State University. Named after President Grover Cleveland, the town formed in 1869 as people moved inland from the Mississippi River. Cleveland attracted many new residents with the arrival of the Louisville, New Orleans & Texas Railroad through the town in 1884, and the area’s timber resources and rich farmland, including Jews. Jews have been part of Cleveland's history ever since-- though small, the Jewish community is still active today. The Kamiens were the first known Jewish family to arrive in Cleveland. Leon Kamien of Poland and his German wife, Rachel, met in New Orleans in the late 1870s and settled in Mississippi sometime before 1880. By 1892, the family had established their first clothing store in Cleveland. In 1904, Leon partnered with his son Isadore to open another store, called Kamien's. Since Saturday was their busiest day, they had to remain open on the Jewish Sabbath to survive economically. In fact, the Kamiens often kept the store open until midnight or later on Saturdays to accommodate their customers. The family business was quite successful and the Kamiens became leading philanthropists in town, donating land for the first Methodist and Baptist churches. 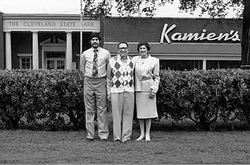 The Kamiens’ store spanned four generations and still exists today under the management of Artie Kamien. Other Jews began to arrive and set down roots in the area around the turn of the century. Maude Kamien, daughter of Leon, married Abe Miller, a member of a popular merchant family. Emil Seelbinder and his wife Sophia—Rachel Kamien's sister—both came from Germany and operated a dairy farm in the area. In 1926, Kaplan’s Variety Store advertised in the local newspaper with its slogan, “So Much for So Little.” Klingman Chevrolet started in the 1920s and lasted into the 1930s. Other Jewish-owned car dealerships were opened later, including Goodman Wooten Motors and Kossman’s, which still sells General Motors vehicles today. Fink’s Drug Store and the Solomon Coal and Transfer Company were also owned by Jews. While Jewish names filled the listings of local businesses in the area, many Jews also got involved in local politics. Such examples included mayors from neighboring towns such as Jacob Cohen of Shaw and M.J. Dattel of Rosedale. By the early 1920s, about ten Jewish families lived in Cleveland, though they had not yet organized religiously. The need to teach their children about Judaism finally inspired them to come together. In the spring of 1922, Mrs. H.L. Weinstein invited Greenville’s rabbi, Samuel A. Rabinowitz, to speak at the local Cleveland PTA. During his visit, the Jews of Cleveland met with him and discussed forming a local religious school. From this informal meeting and a second formal gathering in a room on the top of Cleveland State Bank, Rabbi Rabinowitz agreed to lead the religious school, which became the first Jewish religious institution in Cleveland. The school, known as the Community Hebrew School, catered to Jewish children throughout Bolivar County, and eventually Sunflower County. Conducted at the Cleveland Consolidated School, the religious school first held classes in 1923. The school proved to be a great success, with 53 children coming on Sundays in its first year. The adults of the community began to worship together as a congregation in 1923, including those from Drew, Ruleville, Rosedale, Shaw, Boyle, Pace, Merigold, and Shelby. Jacob Borodofsky was the first president, and an adult bible class met every Sunday, led by knowledgeable congregation members. Rabbi Rabinowitz came to Cleveland on the last Sunday of each month to lead services. For its first four years, the group held services in a local high school auditorium, and members began to raise money to build a permanent home for the congregation. Between 1926 and 1927, Joe Fink and Leo Shoenholz led the capital campaign for the first building of the congregation they now called Adath Israel (Community of Israel). They found great support throughout the region. Non-Jews donated nearly $4,000 for the project, while warehouses in Memphis and St. Louis contributed $1,200. The small Jewish community of Merigold raised $750, while Mrs. Dattel and co-workers of Rosedale outdid their neighbors with contributions of $1,000. Work began on the new building in the fall of 1926. 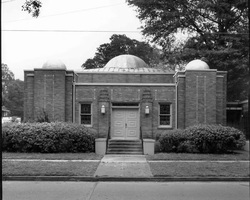 Four years after the first organization of the congregation, in February 1927, its members dedicated their Moorish-designed building at the corner of Bolivar and Shelby Streets. In September of that year, Adath Israel members celebrated their first high holidays in the new building, conducted by a student rabbi. The next year, the congregation hired Rabbi Jacob Halevi as their resident rabbi. His tenure continued until 1931, after which Carl Schorr, Hirsch L. Freund, and Newton Friedman served the congregation. In 1934, Adath Israel joined the Union of American Hebrew Congregations and began using the Reform Union Prayer Book. Interestingly, Cleveland never had a Jewish cemetery, so some Jews were buried in the main city cemetery or found burial sites in Greenville. According to local lore, the reason for never starting a cemetery was that no one wanted to be the first to be buried there. Soon after the new building was constructed, the Great Depression hit Cleveland at full force. While finances were tight, causing the building to fall into disrepair, charity drives at the synagogue brought in over a thousand dollars annually, while the congregation’s income was still high enough to pay a rabbi’s salary. Despite hard times, membership grew during this period, increasing from 70 to 89 families between 1928 and 1937. By the late 1940s, the congregation had over 100 members, and by the mid-1950s, it had nearly 75 children in its religious school. During this period, Sunday school and Friday night services were staples of religious life at Adath Israel. A series of rabbis served the congregation over the years, including Louis Josephson, Julian Feingold, Simon Cohen, Morris Shapiro, and Henry Schwartz. In 1950, the congregation built a $30,000 annex, which included a social hall, kitchen, and new classrooms. Members of the congregation were strong supporters of the fledgling state of Israel with Mose Hyman and Leo Shoenholz leading an Israel bond drive which raised $35,000 in the late 1940s. During the years after World War II , Cleveland Jews remained concentrated in retail trade. Sydney Howard Hytken ran his high fashion ladies’ ready-to-wear shop called “The Parisian.” Other stores included Kossman Appliance Company, Marcel Davidow’s Western Auto Associate Store, Kay’s Style Shop, and Levingston Furniture. In Shaw, Harry and Sarah Rubenstein sold shoes, dresses, and work clothes to farming families that bought clothes once or twice a year; they finally closed the store in 1977 after over 60 years in business. In 1957, Adath Israel finally began to enjoy some rabbinic stability with the arrival of Rabbi Moses Landau, who served the congregation well into the 1990s. Under his leadership, the congregation thrived. In the 1960s, the congregation renovated its sanctuary, built a rabbi’s study, and also acquired a parsonage for the rabbi.Cleveland’s Jewish community continued to thrive during the 1960s and early 1970s, reaching its peak Jewish population of 280 individuals during this era. The 1950s and '60s saw the emergence of temple youth programs. While Mrs. Ben Sklar of Cleveland became the state chairman of the Mississippi Federation of Temple Youth in 1946, Cleveland did not have a youth group until 1947. By the early 1960s, it was one of the largest temple youth groups in the state, also serving the much smaller Temple Beth Israel of Greenwood, as well as the Jewish youth of many small Delta towns. Macy Hart, founder and president of the Institute of Southern Jewish Life, came from this Cleveland group and became national president of the North American Federation of Temple Youth in the late 1960s. The women of Adath Israel have long played a leading role in the congregation. The first women’s organization was formed in 1915 under the name “Busy Bees,” which combined the Jewish sewing circles of Ruleville and Drew with discussion sessions and charity. This organization predated the founding of the congregation by at least eight years. They later became members of the National Federation of Temple Sisterhoods in 1927. These women played an integral role in establishing the first religious school and raising funds to build the temple. In addition, they performed countless services that kept the synagogue strong, including bake sales and luncheons. They also donated a musical organ, library books, kitchen accessories, curtains, and shrubbery. During World War II, the Adath Israel Sisterhood won the Meritorious Service Award for selling more defense bonds than any other group in the area. The Jewish men of Cleveland formed a local B’nai B’rith chapter in 1928, amassing nearly 75 members. In 1965, a group of men received affiliation from the National Federation of Temple Brotherhood; however, this club was inactive throughout most of Adath Israel’s history. By the 1980s, the Jewish population of Cleveland had begun to decline sharply as many older Jews died or moved away. At the same time, many of Cleveland’s Jewish youth left to seek educational and career opportunities in bigger cities. Memphis was close enough to Cleveland that many residents of Bolivar County left for the city. Jewish businesses changed in the Cleveland area as well. The changing retail market forced these old Jewish merchants to evolve or perish. Some of these businesses have survived the stiff competition from discount chains, but many others did not. Accordingly, over the last few decades, membership at Adath Israel has dwindled. Nevertheless, Adath Israel remains active with regular services. In 2005, a historical marker was erected commemorating the Adath Israel congregation. Cleveland has changed over the past century, but the town has never lost its Jewish community. From timber and cotton to manufacturing and Delta State, Jewish commerce and the Adath Israel temple remain after all these years.